Mrs. Margaret Alexander age 95, of Hendersonville, TN, passed away on June 27, 2018. Mrs. Alexander was born in Fireco, WV on May 27, 1923, the daughter of the late Mannie and Blanche Griffith. 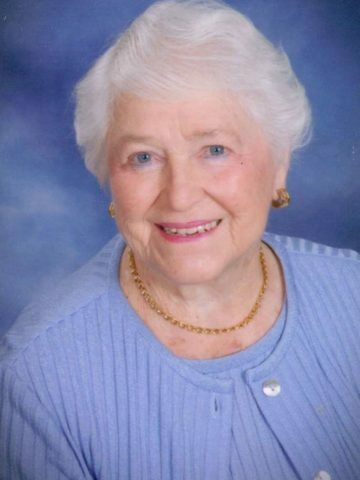 She was a long time active member of Neely’s Bend United Methodist Church and Hendersonville First United Methodist Church. Also, a member of the Newcomers Club of Hendersonville and the Young at Heart Club. Margaret was a devout Christian lady who loved to serve others and sing songs of Jesus. In addition to her parents, Mrs. Alexander is preceded in death by her husband, Arthur Alexander, Sr. Survivors include her sons, Arthur (Peggy) Alexander and Jim (Joann) Alexander; five grandchildren; and twelve great-grandchildren. A Celebration of Life will be held Monday, July 2, 2018, at 9:00 A.M., Hendersonville First United Methodist Church. Interment will follow at Spring Hill Cemetery. Gathering of Family & Friends will be held Sunday from 4:00 P.M. until 8:00 P.M. at Hendersonville Funeral Home. In lieu of flowers the family respectfully requests memorial contributions be made to Hendersonville First United Methodist Church 217 E Main Street, Hendersonville, TN 37075. Thanks for your unconditional friendship you will remain a shining star in my life,you were the real deal,not enough folks like you,I am a better person as a result of your friendship,loved your humor,your gusto,You were a great compliment to aging,you just continued to be the same Margaret that enriched all who knew you. Margaret was a shining example for all of us who were blessed to know her. She always had a smile and a kind word along with her hugs. She was certainly a roll model on grace and positive thinking. Margaret was my model of who I would like to be more like. I, personally, feel that my life is richer for having known her. I will miss seeing her smile, her suites and her wonderful hats. A life well lived and lovingly remembered. Margaret was such a wonderful neighbor and friend when we purchased our first home years ago. She gave me a baby shower and brought all the new neighbors together. She was so gracious and loving. Years later, we connected again at Newcomers, and she always remembered the fun times we had in that neighborhood. I appreciated her friendship and example. Your smile, your grace and you total support of our Newcomers will be so truly missed!